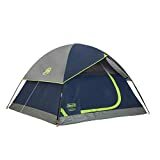 To those who do camping at least once a month or those who are planning to go camping soon, are you looking for a tent that can cover up in all kind of situation? There is plenty of brands available in the market, but do you still find it difficult to choose the right one? Of course, you surely want tent that is easy to build and remove, can keep you warm, protect from mosquitoes’ bites, or fit enough people, don’t you? Then you are definitely following the right track! We will bring you to a list of the top 5 most recommended tent brands after having used by countless users from the beginning. The comments from the customers were incredible that match perfectly to the actual quality. Some of them are not just strong looking, but they are quite beneficial in different forms. Let’s go check them out! 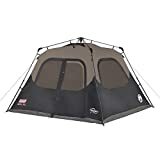 If you are in search of the tent that can fit in a big group of people and can handle in any risky kind of weather in the forest, this tent from Coleman is especially the best ideal one for you. With the availability of three queen size air-beds which allow at least 8 people to sleep inside, this spacious tent also has an extended door awning to keep your shoes protected. Due to the spacious that mention earlier, you have to also know that it is a size of 16 x 7 feet with 6-foot 2-inch center height which is huge enough to fit in. Plus, it has a system on the cover to keep out of the water, therefore it helps produce warmness inside. Regarding the setup, you will only need 15 minutes and you will be ready dive in this cozy room in the middle of the forest. Definitely, a recommendation if you are having a small group of people but want to spend some time away from the crowded city and want to feel like home. Sundome tent might look a bit small on the outside with a measure of 9 x 7 feet, but you would not imagine how spacious it is on the inside. You can move around as if it is your real room, while you can still put in 4 more people in just this one tent. This brand is also specially built with WeatherTec system that is to help with securing the floor and protect the whole area from getting wet. There is a large flexible window or door where you can enter your space and it is fully secure with a proper zipper shield. Therefore you no need to worry about people getting in your place, the room is all yours! Just a little bit larger than the previous tent, this instant built-in room is partly made of polyester and tapes seams. The two-time thickness of fabric itself is for keeping the whole space warm and securing the safeness of the people in there. Apparently, the thicker the fabric is, the longer the tent will last and this Coleman will prove you right. As you can see, it is a product of Coleman, therefore it has the same WeatherTec system that will always guarantee the dryness on where you will be stepping on. There is an upgrade on the airflow that allows the air to go through much easier without having to open the door. In order to make it even more convenient for users to carry around especially for backpackers, it also comes with a cover pack which you can just unpack and get it ready in just one minute. 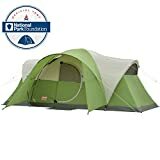 Introducing the fourth most popular tent that comes from Coleman. Those who normally afraid that there is no proper sleeping space in a tent, this product will definitely prove you wrong. 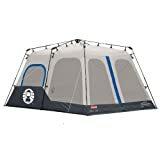 As its size is 14 x 10 feet and the center height of 6 foot 7-inch, this 8 person tent can put in 2 queen size air beds which you are free to move. With the structure of weather system, your concern about leaking or wet floor is no longer an issue. It will make sure where you are staying is dry, clean, and safe. Plus, regarding the setting up stage, these tents come up with three easy steps for the convenience for all their customers. Unlike others, you won’t need to go find this or that equipment to support, the set is ready for you in one go. You also have 3 color choices; black, blue, and brown! A tent is like an igloo in the pole but it is for summer. The last recommendation for the best-camping tent would be this Wenzel tent. This set is an ideal one for a big family camping trip in which all of you can stay in one warm cozy space. Based on its name, it has already mentioned 8 people, so it is very spacious inside with the floor of 90 square feet. The special part about this tent is, there is also a screening room right at the entry door where you can enjoy the scenery before jumping into bed. It is just like a corridor at home, and do not worry, the camping porch fabric is already made for protection from sunlight, so you won’t be affected by the surrounding environment. Moreover, the zippered door and 2 windows are definitely where this product can keep the camp warm.